The B&B was full of love, laughter, and warm memories this weekend. The Wilson family gathered here in Carlisle for a family reunion and a memorial service. The family staying here came from Florida, Kansas, and Massachusetts. They enjoyed spending time together on the patio, under the tree by the tennis court, strolling around our lawns, touring the barn, visiting with the horses, and catching a glimpse of some young deer as they walked the labyrinth in the early morning hours. We enjoyed watching them spend some time together! This "job" is so special because we have the opportunity to meet such wonderful people! Last week we had some special equine guests who stayed with us on their way to a driving competition at Walnut Hill Farm in Pittsford, NY. The night these horses stayed here, we had a spectacular sunset! I tried to get some pictures of the horse AND sunset but these photos certainly can not give you a sense of how beautiful the scene was. We also hosted some fun pups last week. Pheasant Field B&B seemed to be a perfect spot for these dogs (and their owners) to escape from the New York City area for a night. Running in the lawn and jumping in the pond was just what they wanted to do! Summer is winding down but we still have some rooms open for next weekend. 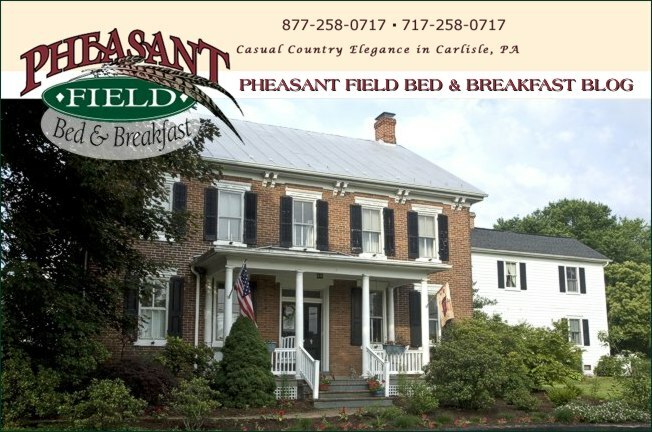 Bring "Fido" or your horse for a quick getaway to Pheasant Field B&B before the summer ends.